A shot from the Blockchain Forum. Credit: Will Diamond. On Wednesday, November 7, 2018, Kogod hosted the first annual Blockchain Forum in the Washington College of Law’s Claudio Grossman Hall. 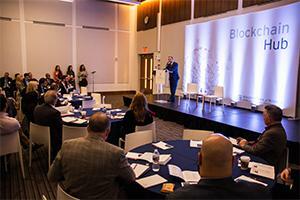 The gathering brought together experts from the private and public sectors, non-profit leaders and academics to discuss the impact of blockchain technology on the business world. The half-day event featured keynote speeches, moderated discussions, panel discussions and short “TED talks.” Participants included Dr. Tomicah Tillemann, chairman of the Global Blockchain Business Council; Dante Disparte, CEO and founder of Risk Cooperative; Mihaela Ulieru of Endor.com; and Jose Arrieta, Associate Deputy Assistant Secretary at the Department of Health and Human Services, among many others. Issues examined included the current state of blockchain, its role as a fad or a transformative technology, different use cases and the future of the technology. The Kogod Blockchain Forum was conceptualized and organized by Professors Ayman Omar and Bob Sicina as part of a larger blockchain initiative within the school. Over the next year, Omar and Sicina will continue forming a Blockchain Hub in efforts to establish Kogod as a world class blockchain learning and research platform. The Hub includes blockchain courses, research projects/publications, and the Forum as its central component. Stay tuned for more information on the Blockchain Hub!